It is a very accurate cliche that New Yorkers make the best bagels. And let me tell you, I am a major fan of the doughy breakfast treat. I can eat them plain, stuffed with veggies or doused in any sort of delicious creamy spread. Bagels are good any way that they are prepared. I’ll admit, there have been a shameful amount of time spent looking at pictures of bagels on instagram. Because I am someone that is consistently health and weight conscious, indulging in carb dense foods and empty calories is a rare occurrence. The other night, while I laid in bed awaiting my midnight cravings, I had an idea. Let’s make healthy foods taste like bagels. This has been an idea conceptualized before, but never in my kitchen. The components of an everything bagel seed mixture can be found in most grocery stores. One of my new favorite go-to snacks is a thin brown rice cake with vegan cream cheese, cucumber and our everything bagel mixture. So now that you have your everything bagel concoction, we can proceed to the intended recipe. 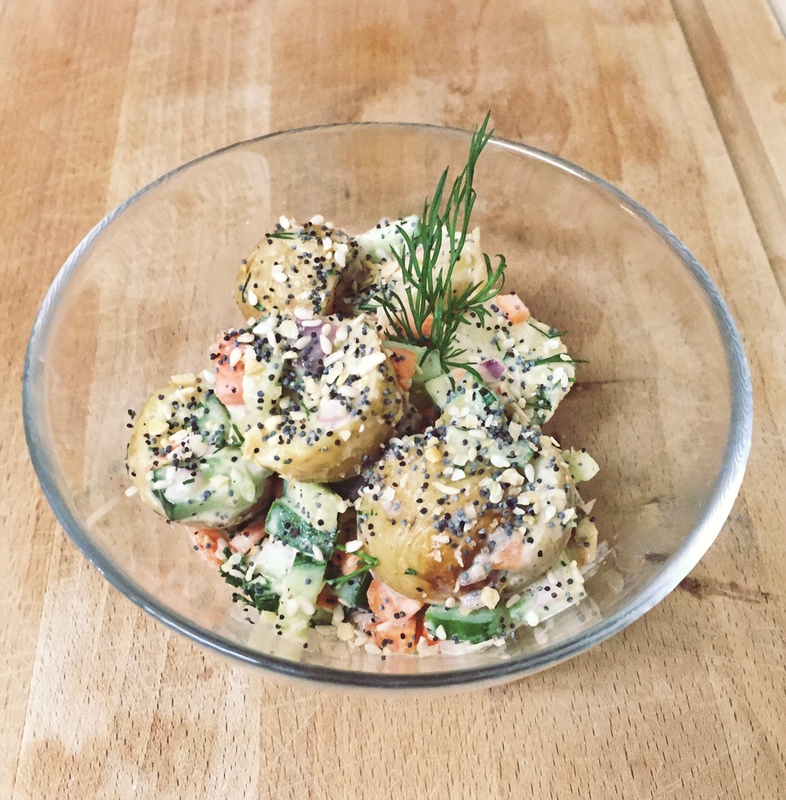 Healthy, delicious, light vegan everything bagel potato salad. Now, although this salad is delectable and clean, don’t expect it to taste exactly like a New York bagel, it’s still potato salad. 5. Making the dressing: whisk together mustard, ACV, lemon juice and mayo. Set aside. 6. Chop up carrots, onion, cucumber, dill and garlic. 7. Let the potatoes cool down once out of the oven. 8. Cut each potato in half and put in a medium size bowl. 9. Drizzle dressing over potatoes and add all of the chopped veggies. 10. Gently toss. For each serving, sprinkle a generous amount of the everything bagel mixture on top. 11. Serve room temperature or cold. Enjoy! I’m going to try this tomorrow for my facial party girlfriends. Sounds delicious!!! !